Butterfly bush or Buddleia davidii is a flowering bush that is native to China. This perennial plant forms clusters of fragrant flowers in purple, blue, pink, red, or white. True to its name, the butterfly bush is a butterfly magnet, attracting all types of butterflies. It is a must have for the butterfly garden. Growing Buddleia is quite easy as they thrive in many types of soils and climates. These hardy shrubs can be successfully grown in zones 5-10. Plant them in full sun in well-drained soil. Although butterfly bush handles drought very well, it benefits from a good layer of mulch. Plant the shrub in the early spring or fall. Depending on the variety, plan to space the plants 5-10 feet apart. To prepare the bed, loosen the soil to a depth of about one foot. Mix in a four-inch layer of compost. Dig a hole twice the size of the pot that the plant is in. Remove the plant from its container and place in the hole so that the top of the rootball is level with the surface of the soil. Fill in around the rootball and water thoroughly. Blooms begin to appear in July and continue prolifically until frost. Many varieties of Buddleia bloom on new wood so always prune in the fall after blooming stops. It is important to remove the dead flower clusters because, unlike other plants, the flowers will not drop on their own. If planted near windows the fragrance will scent an entire room.The butterfly bush can grow anywhere from 6-12 feet tall and spread up to 15 feet wide. The unruly, drooping branches make this shrub look best in a casual setting rather than a formal one. The plants are invasive, and in warm climates are beginning to be considered an invasive weed in some areas. Volunteer seedlings can easily take over and choke out other plants. Be sure to pull up the seedling as you find them. They are usually hybridized and will not be the same as the parent plant. While most people think of the butterfly bush as plant to attract butterflies, there are other things that find it irresistible. Hummingbirds love the flowers, and are especially attracted to the red ones. Bees can be encouraged to visit your garden with Buddleia in the vicinity. There are other beneficial insects, such as ladybugs, that will find their way to this plant and into your garden. 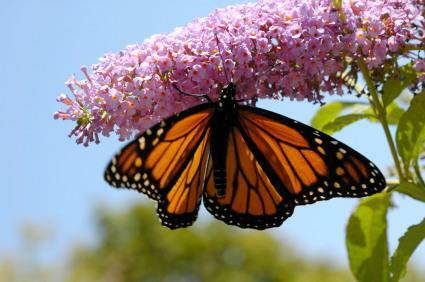 There are well over 200 varieties of butterfly bush. The chart below gives the name and details about some of them. With their vigorous growth habit, their scented blossoms, and their ability to encourage wildlife to the garden, Buddleia davidii is an excellent plant to have in your landscape. Whether you enjoy the cut flowers in a beautiful vase, or outside of your window covered in swallowtails, this plant will give you years of enjoyment with little effort.